Six environmental days and weeks namely, Wetlands Day, World Water Day, Biodiversity Day, World Environmental Day, Arbor Week and Weed Buster Week are celebrated through events with schools and communities either in the Garden or in an appropriate local community context. The activities for each celebration resonate with the annual themes for each environmental day/ week. A comprehensive programme of careers in biodiversity is facilitated with educators and learners. 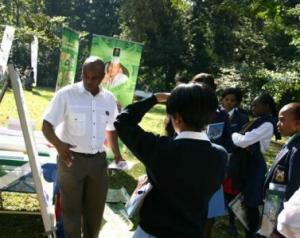 Career days are celebrated with learners in the Garden or at selected schools. Learners and parents are exposed to various institutions that offer further study in the fields of biodiversity and conservation; they are also given information on various organisations that offer careers in these fields. For the 2015 to 2016 period, two career days will be celebrated with schools. One will be a careers expo with high schools hosted in the Garden and the other will be hosted at a primary school that will be visited by the Biodiversity Education and Empowerment staff from the Garden. Special holiday programmes are run for youth or adult groups during the school holidays. These cater for youth and adults at institutions such as orphanages, places of safety, community-based organisations, etc. The activities of such programmes are fun, enjoyable and educational. The KZN National Botanical Garden provides these programmes during the June/ July, September/ October and December/January holidays.